A practical storage solution for any kitchen keeping al your bread rolls and pastries fresher for longer! 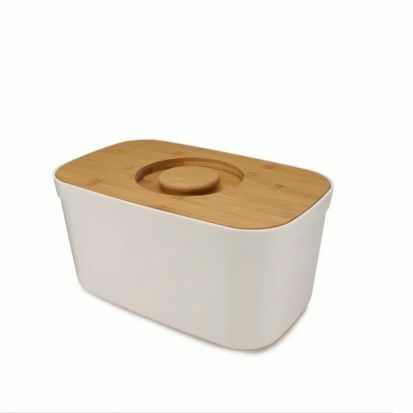 This stylish bread bin has an easy-clean polypropylene base with a non-slip foot and a high quality bamboo lid that doubles as a handy cutting board when flipped. The lid features an easy-lift handle and crumb-catching grooves on the reverse. For storing dry foods only. Oil bamboo regularly with a food-safe mineral oil to maintain best condition.